Is this an old church being destroyed in France? 2800 churches could be destroyed in France in the next 10 years according to current trends. Catholicism is weakened from inside and outside, islam is booming because of petro-dollars and islamic immigration. One doesn't need to be religious at all to find this quite upsetting, I guess. These are old buildings and they are valuable for obvious reasons. Is this video real at all? What happened exactly here? Why is this old church being destroyed? Did it happen in France? Fewer than 300 churches had been demolished between 1905 and 2014, the Catholic newspaper La Croix reported, out of more than 42,000 in total. According to Benoît de Sagazan, author of Patrimoine en blog, 28 churches have been demolished since 2000 - mostly in former industrial districts, with a peak (six) in 2013, which could explain the revived sensitivity of the French. So, yes, sometimes churches are being demolished for a variety of reasons (including lack of maintenance, failing structures, dwindling attendance, or financial problems of the owner), but there is no basis to claim a "[current trend that] 2800 churches could be destroyed in the next 10 years", at least not without some major statistics mumbo-jumbo. 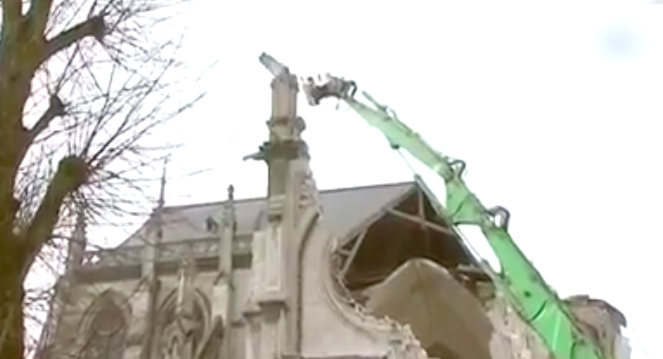 The video is from April 2013 - the destruction of Saint-Jacques’ church in the north of France started at 13 Feb that year. La Croix provides a timeline of this specific church and what led to this building being demolished. Built between 1868 and 1878, the church of Saint-James, in neo-Gothic style, survived two world wars and the bombings. But unstable soil, water infiltration and the storm of 2004 have undermined the building, which is collapsing in places. Religious services have not been celebrated there for twelve years. The walls are cracked, the windows caved in, a birch grows on the buttresses. At the start of the month, with the thaw, blocks of stone fell from the church. Immediately, the city council acted on a meaure of imminent peril, evacuated the neighborhood and forbade access to the next-door school. An expert was sent urgently. In the wake of this, some machines "made safe" the building, by collapsing the choir. The priest does not question the decision of the town hall, but rather the method. For him, it is "a reality that's powerfully symbolic, loaded with history, which brought together the faithful for a century" which they are putting to the ground (a.k.a. "burying"). Instead of the religious building, the municipality wants to build a square and promises to "leave a trace of the church" . Father Brunel was not discouraged. In this destruction he sees "a true Lenten call to attach himself to Christ and to the living Church". If the destruction of this church building was part of a "Muslim Conspiracy" or something along those lines, you would not expect one of the priests to be OK with it. It seems as if this church had just been unused for a long time, followed by it becoming structurally unsound and condemned. Not the answer you're looking for? Browse other questions tagged politics religion islam catholic-church france . Has the Catholic Church ever retracted an “ex cathedra” statement? Does the Catholic Church prohibit abortion? Does the Catholic church accept evolution? Are there officially pronounced “no-go” Islamic zones in France? Are Muslim headscarves banned in France? Is this 90 year old mummy “not dead, just meditating”? Do 42% of young muslims in France support suicide bombings? Do only 800K of 6M Muslims work in France?